Time for another New Brunswick rock band update! This summer we printed our long-lost article on the 1980’s New Brunswick, NJ music scene. It brought back lots of memories for those who were there. We’re happy to say that it also brought back the Rockin’ Bricks! 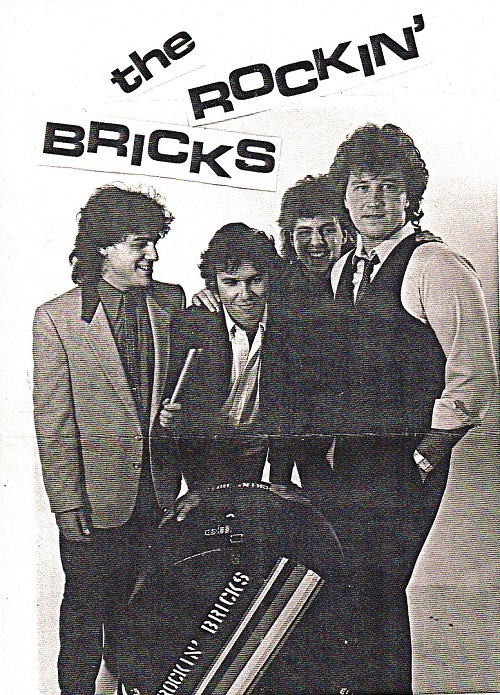 The Rockin’ Bricks were featured in part 3 of our series. Comments about the article encouraged them to plan a one night only reunion. This long-awaited show will take place on Friday December 22nd at 8 pm. The venue will be Pino’s, at 13 North 4th Ave in Highland Park (just across the river from dear old New Brunswick). 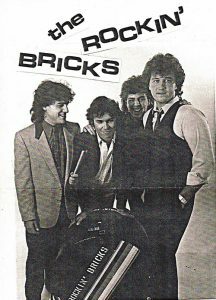 The classic Rockin’ Bricks lineup will be playing: Pete Tomlinson and Joe Hosey on guitars, Chris Breetveld on bass, and Dino DiMartino on drums. Opening the show will be Andy B. and the SoulFolk. You probably know Andy B from the VooDUDES (who will be back in Asbury Park to play the 3rd Annual Asbury Park Mardi Gras on Saturday February 10th). But Andy put out a acclaimed solo album, “My Roots are Showing”, last year, so grab this opportunity to see him doing his own thing. Andy was also a part of the 80’s New Brunswick scene, as lead singer of the Treatment and the Hub City Allstars. Little known fact: He and Pete Tomlinson were neighbors, and played in Andy’s basement as teens. You’ll also get to hear Pete Horvath of the Anderson Council. Psychedelic band The Anderson Council also started in the New Brunswick area, in 1999, and has had several songs named “Coolest Song in the World” on Little Steven’s Underground Garage. So don’t miss this New Brunswick music retro event! Get all the details here. And if you want to dress like you did in the 80’s, well. you know where to get your throwback fashions. In other New Brunswick band news, Eliot Lurie will be back in New Jersey in December. Eliot was lead singer of Looking Glass. These former Rutgers students were New Brunswick’s big success story in the 70’s, with their #1 hit “Brandy (You’re A Fine Girl). Check out the funky 70’s fashions in this video! Eliot’s been living in Los Angeles since 1984, but will making a rare N.J. appearance at the Cozy Cabin in Greenbrook on December 17th. Get the details here.